I got two hand press, those are great to use for away from the benches load trials. By ensuring that your brass never fall to the ground, the only dirt left are usually soot from the gun powder, which generally can be wiped off easily before sizing and decap. I am with Gelan on this one...I endeavour to never let my brass reach the ground...but if it does it gets dusted off immediately (Army training, always wipe down ammunition that has fallen on the ground before putting it in your magazine). ...This way I can decap my cartridges before cleaning them and cutting down on the wear to my sizing dies. Why the concern about wear to your sizing die mate? Do you plan on doing that much shooting that you will be putting thousands of cases through the die? Keep a rag beside your reloading press and give each case a quick wipe before lubing to resize mate. This also gives you the opportunity to inspect your brass as well. I would be extremely surprised if you get any sort of wear to the die other than what you will through the normal use for resizing. Bear in mind that the decapping and resizing process is done simultaneously so you aren't saving on the number of times you put your cases through the dies and wear to your dies anyway. I have a set of 30.30 dies that I have been using for near enough 30 years and there is no noticeable wear (I can't see any difference, although I haven't measured the inside of them) and the dies size my cases to well within specs of the chamber. If saving wear on your resizing die is the only reason for buying this press, then I would say save your hard earned dollars and if your are really concerned put those dollars towards another sizing die mate. If you are hell bent on getting another press, then I would go for one that will provide the strength for more than just decapping...the "O" Frame is the way to go mate. Plenty strong for anything your will need to do. IMHO, the wearing out of sizing dies by wrong application/selection of case lube would be faster than if you size and decap cases right out of the chamber. Lubrication mate, thats almost the panacea for fitting stuff in small holes . But boy do you have to have fast hands to catch those .45 ACP cases before they hit! Just kidding...but drying cleaned cases is pretty easy if you just use your wife's hairdryer to keep a flow of warm air passing over them. If that creates a conflict at home, as it might, those things are cheap (no need for "salon quality") and don't really have to run that long to get the job done. I used to use them when I was using liquid cleaners but switched to tumbling years ago. Thats where case catchers are great. in the comp when you are not allowed to have them attached to the gun, you would use case catching net, and tune your load so the case fall within a certain area. Yeah, but the mental image of trying to catch those flying cases is much more amusing...but then I'm easily amused! 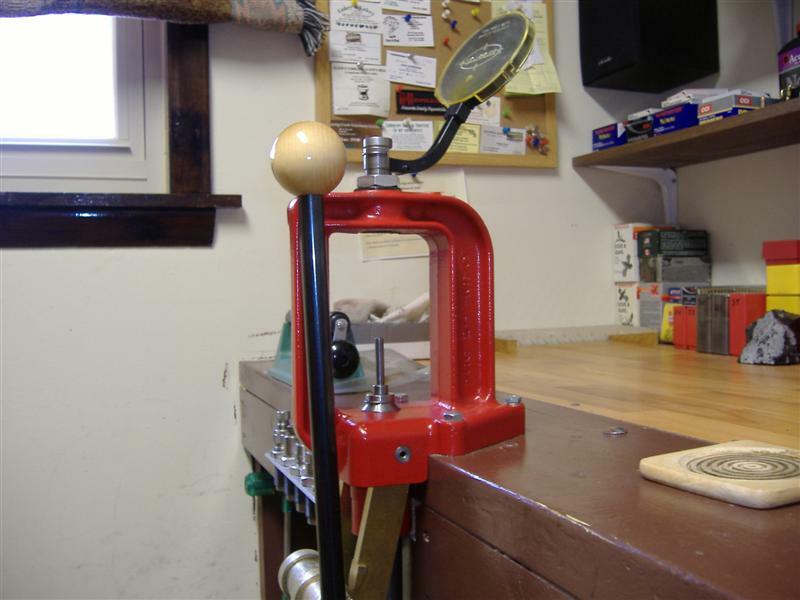 "I am going to pick up a Lee universal decaping die and purchasing this press for that die only. This way I can decap my cartridges before cleaning them and cutting down on the wear to my sizing dies. " I did that ten years ago, wish I'd done it sooner. Drill a 1/2" or larger hole under the spent primer catcher chamber and rig a small bottle under it to collect the primers. Don't sell that little press short. It's stronger and much more rigid than you might think. It's certainly not as massively strong as any cast iron O press but within it's strength limits it's more rigid than my RC II, as confirmed in my own tests FL sizing cases from the same box of .30-06 with the same dies and setting the shoilders back identically. The RC deflected almost 3 thou; the two little Reloaders that I tested didn't deflect my dial indicator enough to get a good measurement! Quart or pint jar with the lid nailed/screwed to the underside of the bench with the hole in it too. Unscrew the jar, dump the spent primers, screw the jar back on. i have the lee Breech Lock Challenger Kit SKU: 90030 and have broke one part. BL CHALLENGER TOGGLE SKU: OF2853. i load 223, 243,3030,270,308,3006,300 win mag on this press and probably done over 10000 rounds of ammunition before it broke. i think i skimped on case lube and had to force it alot harder then normal when it broke. I called lee and they sent me the replacement part free of charge and in less than a week and i live in Canada so shipping usually takes 2 or 3 weeks. I only use single stage presses because i load for precision. 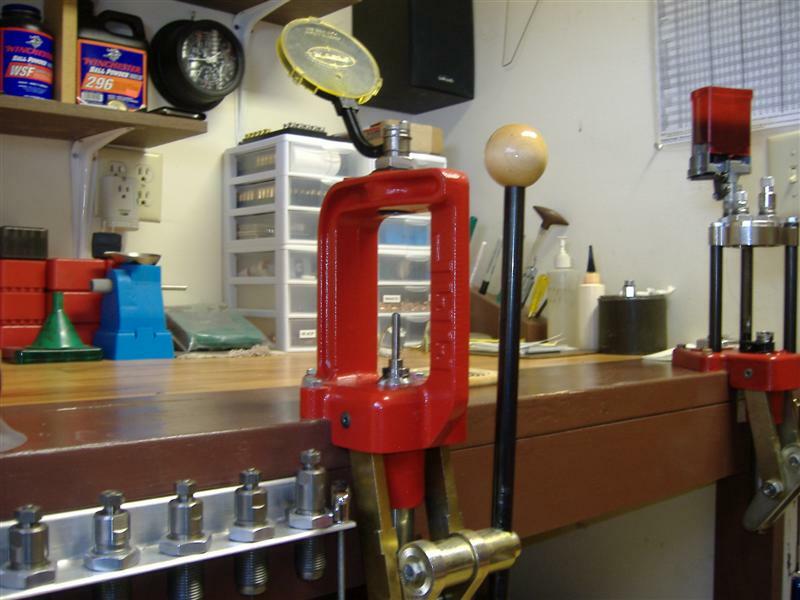 here is a video of the press i use neck sizing 243 win brass. Hummm. First. Welcome to this fine sight. Grab a beer from Vinces ice chest, grab a stump and sit by the fire. One thing I noted is that your bench seems to be a bit weak which does put unneeded strain on the press and may tweek it a bit when applying pressure. I use the Lee single stage "O" (cast iron) press for full resizing and priming. My bench is rather heavily made to iliminate this (as I see it) problem.